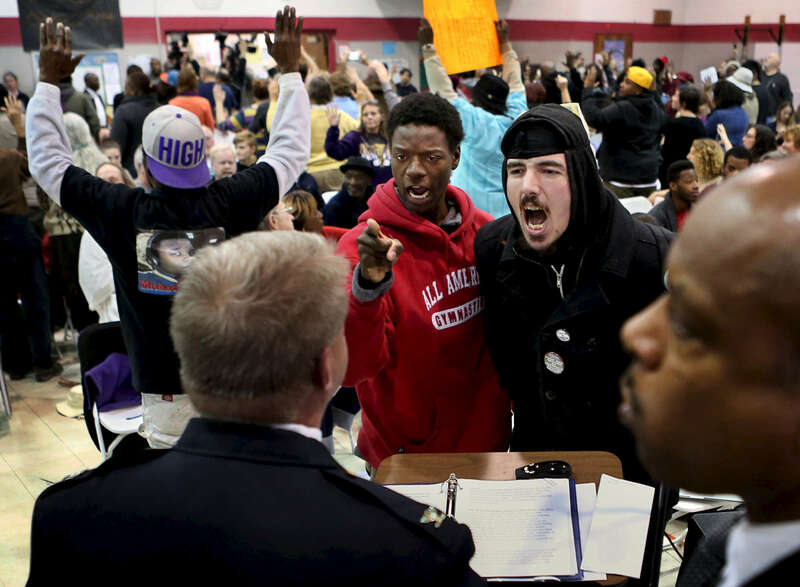 Joshua Williams (left center) and Nicholas Austin Jackson shout at St. Louis police chief Sam Dotson (left) as he tries to give a presentation during the second meeting of the Ferguson Commission in St. Louis on Monday, Dec. 8, 2014. Some in the crowd stood and turned their back on Dotson as he spoke, others heckled him. Ferguson Commission member and Director of the Missouri Department of of Public Safety Dan Isom is pictured to the right. Isom was the St. Louis chief of police before Dotson. The Ferguson Commission was created by the governor of Missouri to attempt to come up with solutions for the issues a raised by the Ferguson protests.